Elvis Costello And The Roots On World Cafe : World Cafe The music superstars appear in the studio to perform songs from their new collaborative album, Wise Up Ghost. While the record is structurally based in hip-hop, it comes out as a little something else. 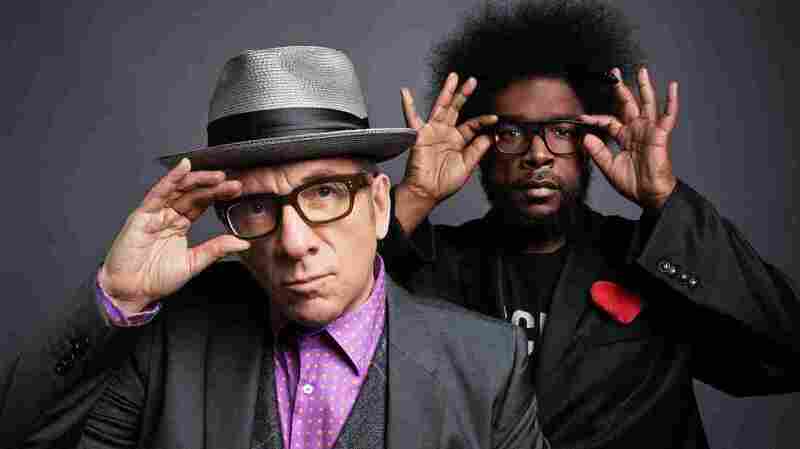 Elvis Costello and ?uestlove of The Roots. In hour one of Tuesday's installment of World Cafe, we talk with Elvis Costello and The Roots' powerhouse drummer Ahmir "?uestlove" Thompson about how they met and came to utilize hip-hop techniques to make a non-hip-hop record. Costello and The Roots unveiled their collaborative album Wise Up Ghost last week — it's a project they'd made in semi-secrecy. Both artists have rich histories as thriving collaborators. The Roots' members have worked alongside artists such as neo-soul singer D'Angelo and hip-hop giants Jay-Z and Eminem, among others. Additionally, the hip-hop group has been the house band for Late Night With Jimmy Fallon since its premiere in 2009. Elvis Costello has been stretching musical boundaries for more than 35 years, and has worked with what seems like everyone, from Paul McCartney and Burt Bacharach to classical singer Anne Sofie von Otter.